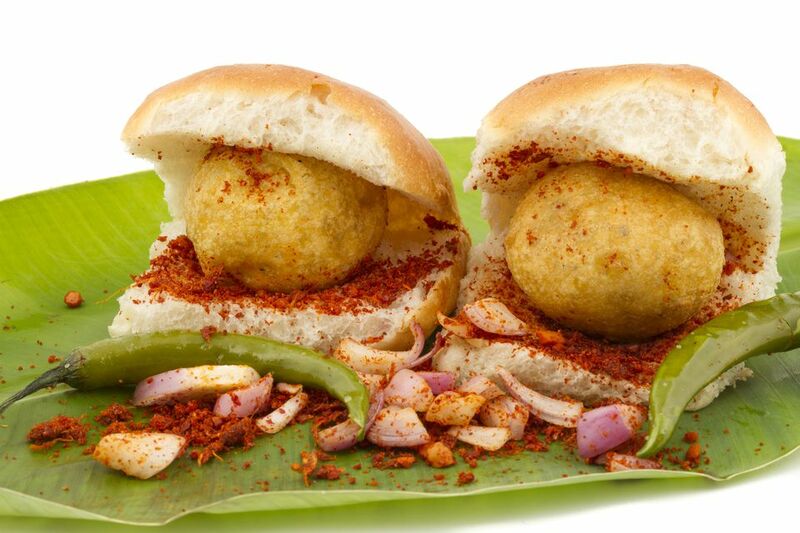 Straight out of the heart of Maharashtra in Western Indian, Vada Pav has iconic status in India. It used to be "poor man's food", but these days even the rich and famous can be spotted eating it at Bombay's (Mumbai) numerous roadside food stalls! Vada means patty and Pav means bun in Hindi. Vada Pav is therefore a potato patty in a bun garnished with delicious, hot, tangy, sweet chutneys and served piping hot. For convenience sake you can pre-make the potato mixture a day earlier (it actually tastes better when done like this as the flavors 'mature' overnight). When you are ready to eat, fry the patties and prep the buns and serve. Lots of people pre-make the chutneys in batches and store in their fridge. That way, when the urge strikes, you are halfway done to producing some delicious Vada Pav. In a large mixing bowl, mix the Bengal gram flour/ besan with enough water and salt to taste, to make a thick, smooth paste. Always add the water a little at a time so that you do not get a runny batter. Stop when the batter is the consistency of a thick soup. When ready, keep aside for later use. Mix the ginger and garlic pastes and add the green chillies to them. Grind into a smooth paste in the food processor. Mix this paste with the mashed potatoes. Season with salt. Heat 2 tbsps of oil in a pan on a medium flame and add the mustard seeds, curry leaves, and turmeric powder. Fry till the seeds stop spluttering. Add this to the potato and mix well. Divide the potato mix into portions slighter smaller than a tennis ball. Smoothen by rolling between slightly greased palms. Heat the oil for deep frying on a medium flame. When the oil is hot, dip one potato ball at a time into the gram flour batter to coat well and then deep fry till golden. Drain on paper towels. Take one Pav bun, slit in half (not completely - leave one edge joined) and put a spoonful each of Tamarind Chutney, Mint-Coriander Chutney and Shengdaana Lehsun Chutney (peanut garlic chutney) each on it. Place a potato ball on the bun and fold over, pressing down gently. Serve while the potato ball is still hot.